It's not often I sit down to create a new pattern from scratch; I wanted to revisit an older idea for a series of bears using short fur to show up the actual shape of the design, I also wanted to create a face which was a little more of a caricature. I have called this a new pattern but I think in reality it is evolution from earlier ideas. So the bear is not really entirely new but he is my current take on a design from the past: Some bright spark once joked about a new Volvo design.... every part is different but it looks much the same, a very sensible approach really and I hope still identifiable as mine. The body is quite plump and the limbs shaped, the elbows curving to match the shape of the legs. 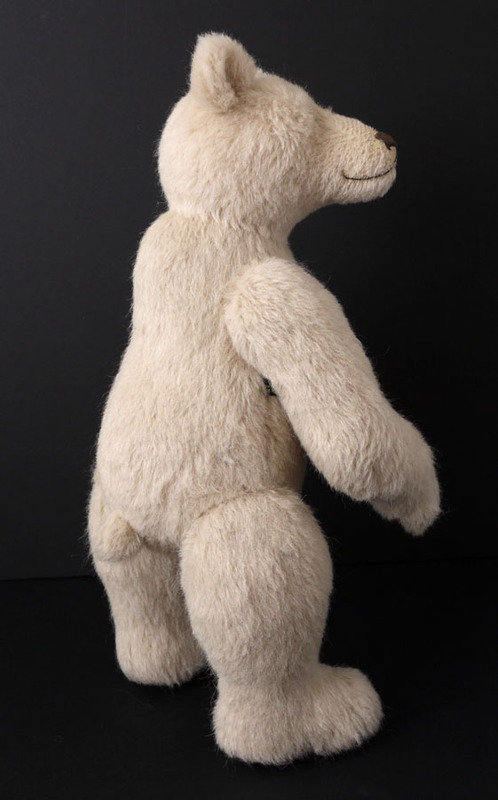 The snout is quite long, flat sided and narrow and the eyes set quite close together, he also has small tightly curled ears. The bear has 5 joints and stands approximately 18 inches tall. The first one is made from a stone/cream coloured Alpaca, it lays very flat and has a quite woolly texture and shows the shaping of the body and limbs. 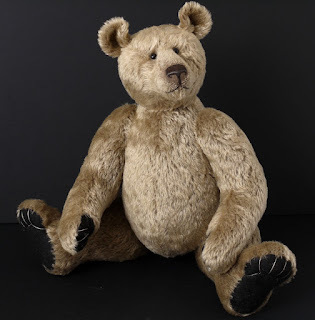 The second bear is made from a short distressed mohair in a soft oyster gold colour, again chosen to focus on the shape of the bear, the head and face in particular are designed to be made from a short fabric to allow the proportions of the pattern to create the face and snout. 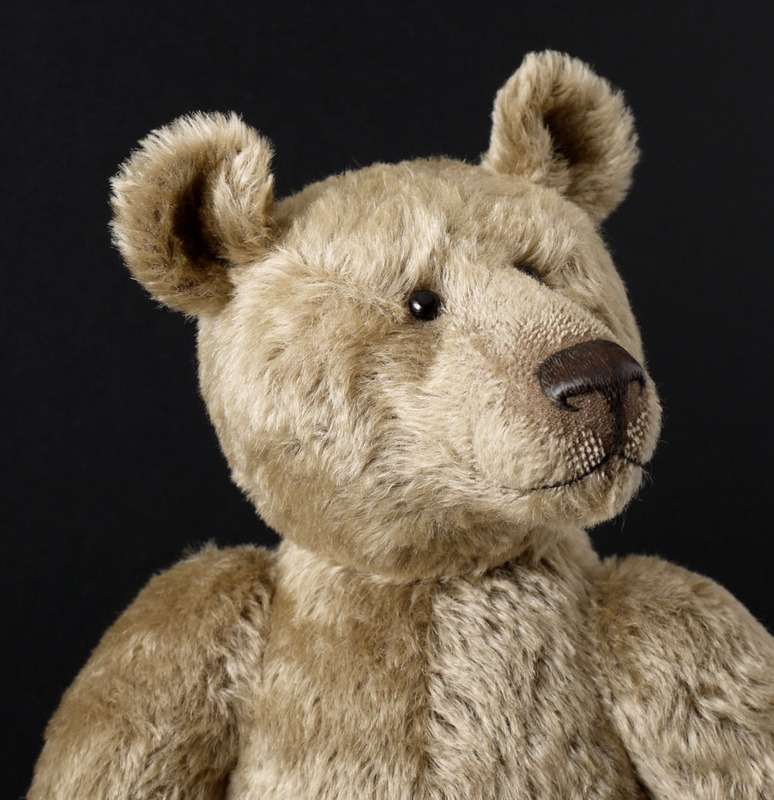 These bears will all have my signature set, waxed and polished nose embroidery and small vintage boot button eyes which I think have a more soulful expression. A close of his face, quite tricky to photograph with that long snout, hopefully a kind and intelligent expression. Both bears will shortly be listed on my website now I am happy with the new pattern and hopefully, time allowing they will lead to other bears in this "family". I recently made a rare find which is a great personal treasure. I will share it but I think first some explanation is required: So for reasons which will become apparent this blog is firstly a biography of a Great Aunt. Please take the time to read through before you click the link at the end. 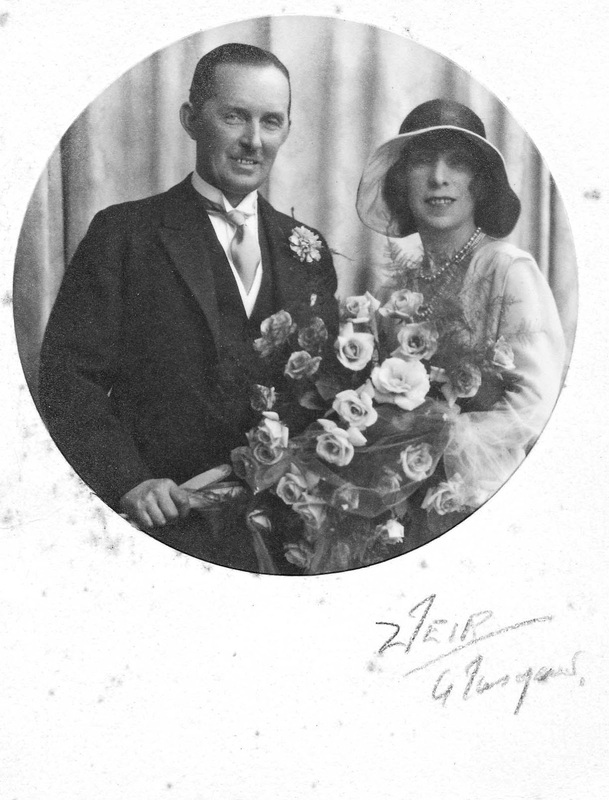 My Grandmother often entertained me by telling me about the various branches of family history and this brought to life my enjoyment of looking through her collections of old photographs which went back to the beginning of that particular art. 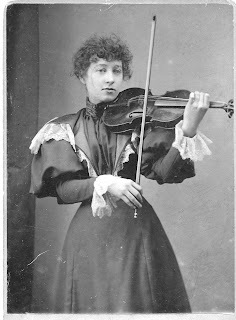 When I began to learn the violin I naturally took a particular interest in one Great Great Aunt, who was my Great Grandfather's sister and had been a professional violinist. The family seemed to use favoured names for any number of children so they were often known by middle names so they didn't get mixed up. So although Christened Georgie she was known as Nelly to distinguish her from the other Georgiannas and Georginas and I knew her as Aunt Nelly Campbell, she was by then 90 and although she took some interest in my efforts of the violin she lived too far away to visit so her story was mostly repeated to me by Grandmother. In more recent years I have of course filled in and confirmed details but could well do more research in the future. 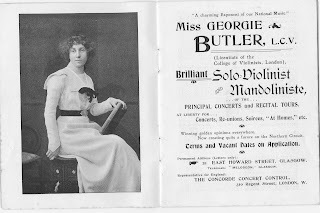 Born in 1875 and Christened Georgie Ellen Butler she had a brother and two sisters, all learned to play musical instruments but Georgie proved especially talented and earned LCV status, a performing diploma, from the London College of Violinists. At the age of 20 she left the family's then home in Carlisle and established herself as a violin teacher and performer based in Glasgow. 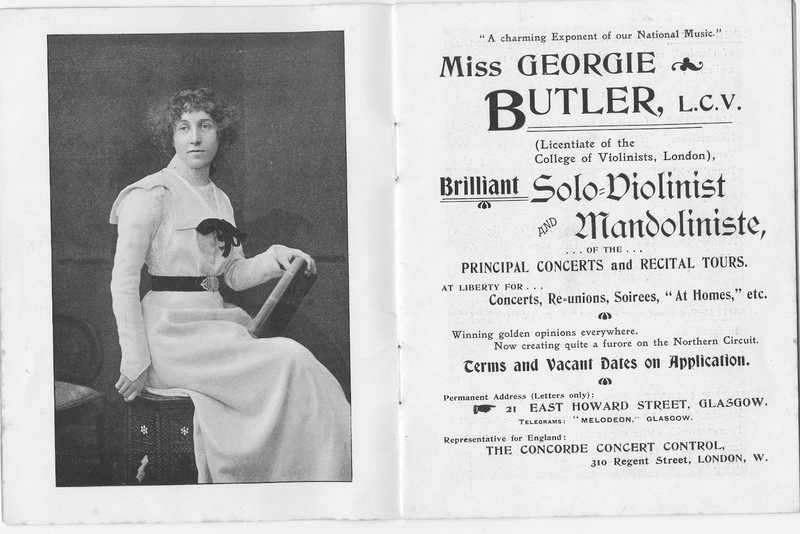 Georgie married a John Campbell in 1902 and in her publicity material was already quoting her telegraphic address as "Melodeons" Glasgow. John Campbell was a partner in the firm of Campbell & Co who were a large well know importer and manufacturer of musical instruments. The firm had been established in 1857 and was especially noted for its melodeons, and indeed was apparently a significant factor in the re-design of the instrument and its popularity in Scottish folk music. During this early period in her marriage Georgie performed regularly on the Northern concert circuit. Judging from contemporary reviews I think she appeared in mixed cultural evenings, some music, some ballet and scenes from plays etc as well as giving recitals of her own. 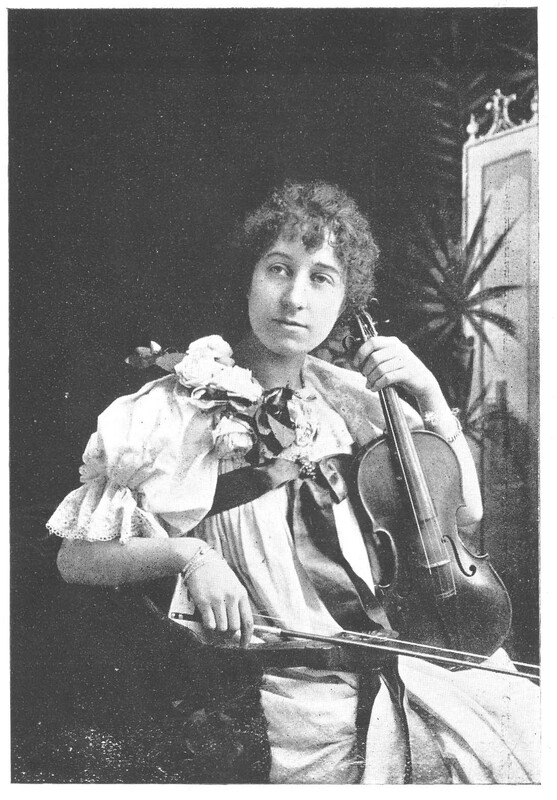 Her repertoire included all the well known violin virtuoso pieces but I suspect that her performances were often lighter music, I know that she played Scottish Airs and was noted for her elaborate variations on these tunes and I even found reference to a skillful imitation of the bagpipes. 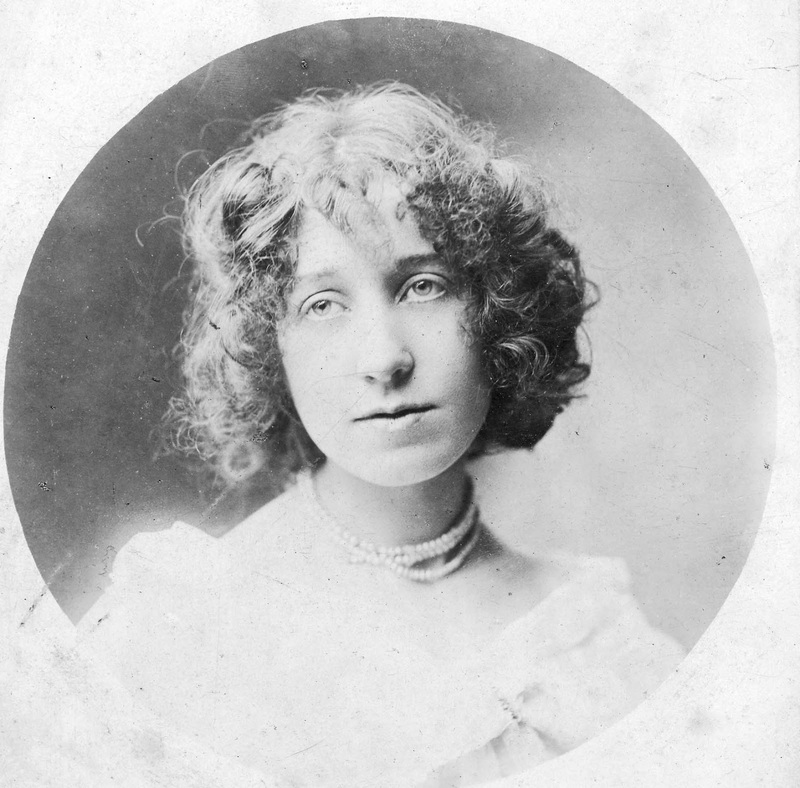 Campbell & Co and her reputation as a violinist brought Georgie to the attention of one of the agents of the Gramophone & Typewriter Company (later absorbed into HMV Records) and in the earliest years of the century she recorded some 78 rpm solo titles for them. I understand she also played in a small orchestra sometimes used to back other artists. These were acoustically recorded 78's and at that time many of the "Great" artists regarded the gramophone as a nasty gimmick and it was seen by many as a novelty rather than a serious means of reproducing music. The records were difficult to copy so production runs were very limited. So by the time I was aware of this bit of family history the records had long since disappeared and no member of the family had kept any, although my Grandmother did confess that the family had had some but thrown them out many years ago. Campbell & Co prospered into the 1920's and I can't see much evidence of Georgie's own performing career from that period, the couple were able to move into a substantial house in the Bearsden suburb of Glasgow and seemed to amass quite a collection of fine things. Campbell's had premises at 42 Sauchiehall Street and at 116 Trongate, opposite the Music Hall. However in 1930 the business partnership between John and his brother split, according to my Grandmother this was due to John's poor business mind but in reality I suspect the effect of the depression on Glasgow was more significant. John's brother maintained the business in smaller premises above shops at the corner of Trongate with an entrance on Candleriggs. Their Trongate shop was next to an alleyway and was replaced by a smaller post war building which is now surrounded by the controversial derelict site opposite the restored Britannia Music Hall in Trongate. I have been even less successful finding other traces of the Sauchiehall St shop, it seems to have closed after 1911 and the address is now part of a much more recent development. The company used the Trongate address on its catalogues, so I speculate that this was also the location of their warehouse. 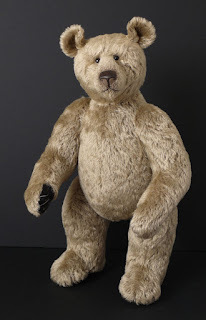 Georgie and her husband moved to Southsea where she ran a small guesthouse, John died in 1958 and some time after that Georgie moved to a tiny cottage outside Canterbury, most of the collections of fine things were I suspect, sold. Unfortunately no sign of her Lupot violin ever emerged. 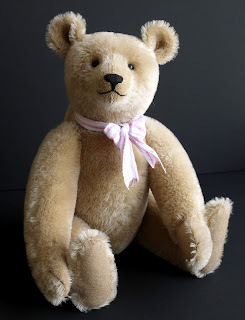 I have one "treasure" which came from her which is a small vase ( I actually blogged that some time ago) but now if you have read thus far I will come to the real treasure which I recently found. I can't pretend it has been a constant life long search but those records intrigued me, over the years I have tried to track down catalogue references, asked different societies if they have ever come across any. The dawn of the internet got me hunting again but nothing ever came up. I found references to Campbell's but never to my Aunt. 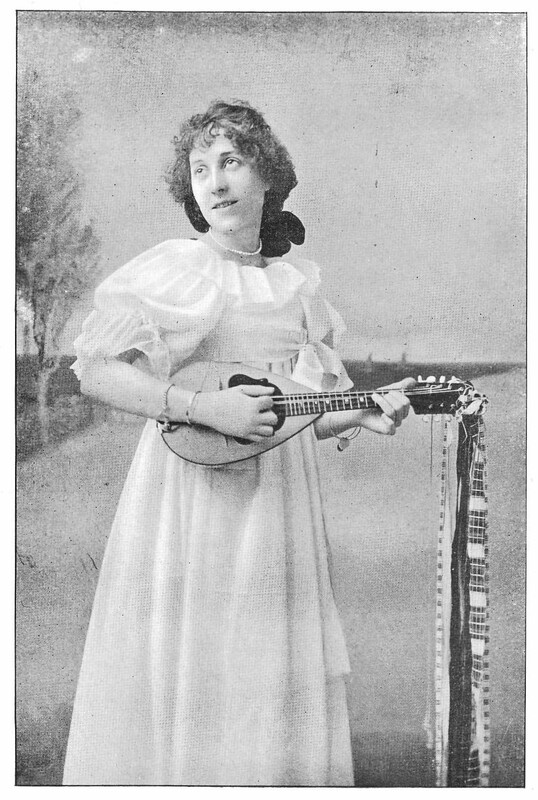 Then, after the best part of 40 years quite by chance I came across a mis-labelled transcription, the owner said it was Annie Laurie played on the Banjo by a Miss Georgie Butler, the beginning is slightly damaged so the start isn't clean and the label described the instrument as a Violin. I was almost afraid to listen to it but as soon as I did I knew what I had found. 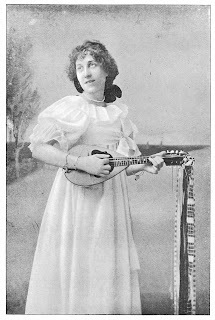 It is only a 7" 78 which lasts just over a minute, it is of course a mandolin, which is her other instrument, and the label described her as a violinist because that is what she normally played. The single verse of the song followed by a variation just fits into the time and it is exactly in character with the type of music Georgie played. So I am probably the only person finding that record who could identify it and somehow I was steered in the right direction to find it. It is crude and scratchy but the charm and spirit of the music is there and most importantly it is the surviving trace of a lady who has always intrigued me. Hearing it for the first time was a most emotional moment which took me by surprise and left me weeping like a baby, I don't expect this quirky record to have the same effect on everyone but if you hit the link below then please listen with affection and share this very very special treasure. It will run as a video. Update: Since posting this a Facebook friend has steered me to a catalogue reference which proves she also recorded her party piece the "imitation of the bagpipes" so now the hunt is on to find it... another G & T 7" Single Side 78 recorded 1903 - hope it doesn't take another 40 years ! 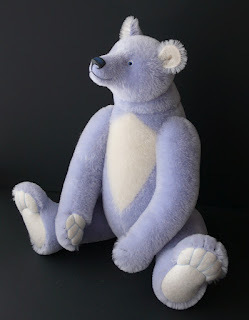 It sometimes seems only a short time ago that I made the break from my life of management accounts and budgets in the City and became a full time bear maker. It was actually 20 years ago and to say that the time has flown by is no exaggeration. 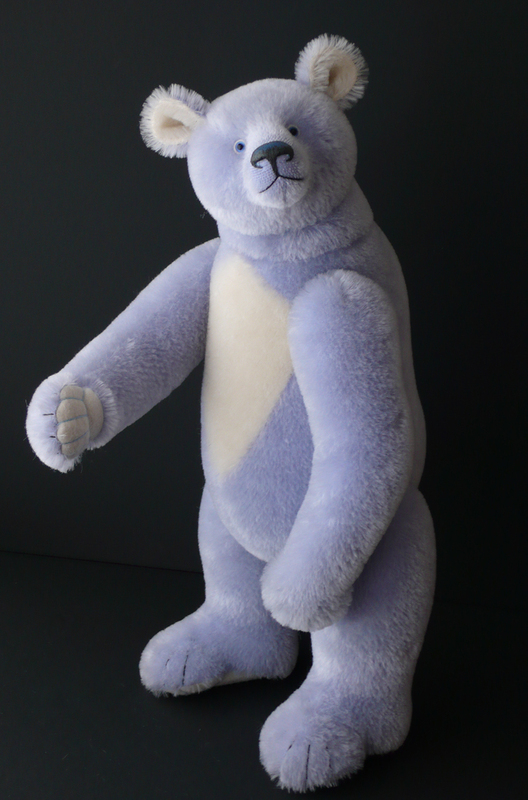 I marked the 10th Anniversary year with a limited edition of 10 bears and I thought that having reached 20 I should embark on a similar project. However for 2012 I had already committed to make 2 other commemorative editions in the early part of the year, those of you who know me well will realise that was unusual enough in itself so I didn't really want to make another "edition" during the same year. So I came up with the notion of a special 20th Anniversary Series. 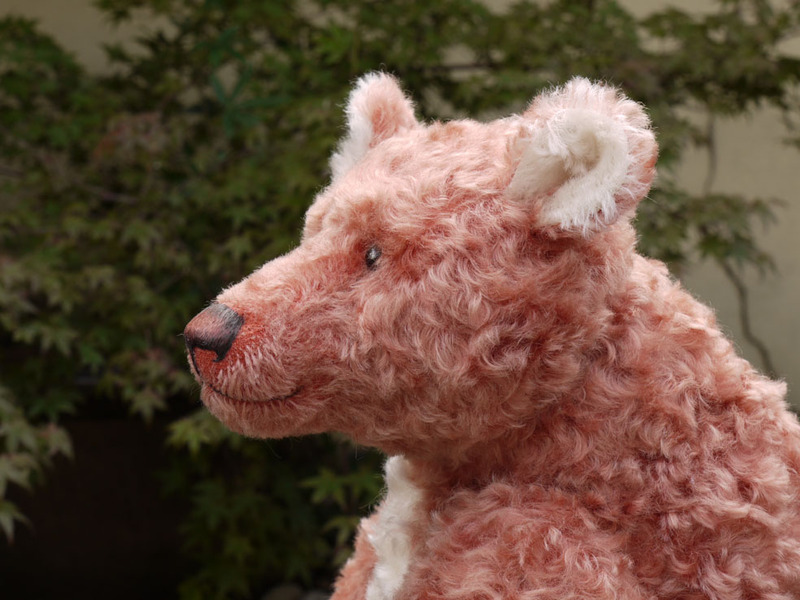 The idea is that each bear will be a different one of a kind. 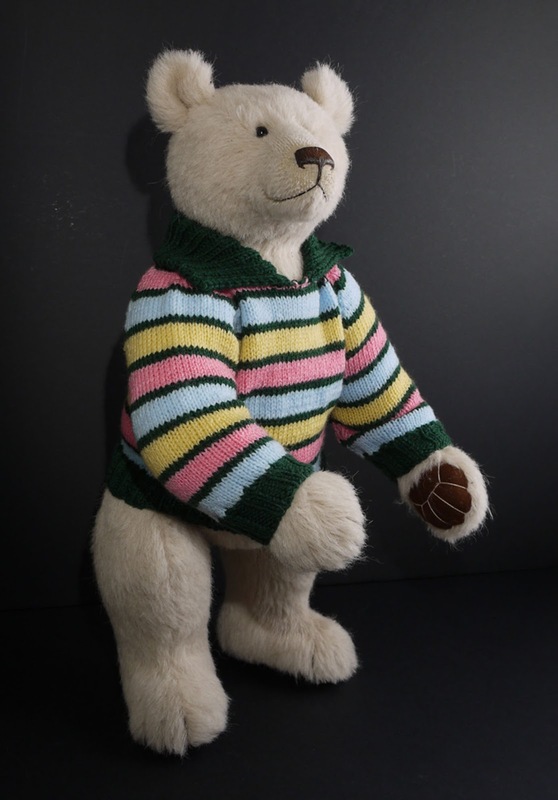 Some of these bears will be remakes of older favourites, they might be special because they represented a new venture for me or simply because they are bears which I particularly liked. Some will be a realisation I have had on my wish list for a while. 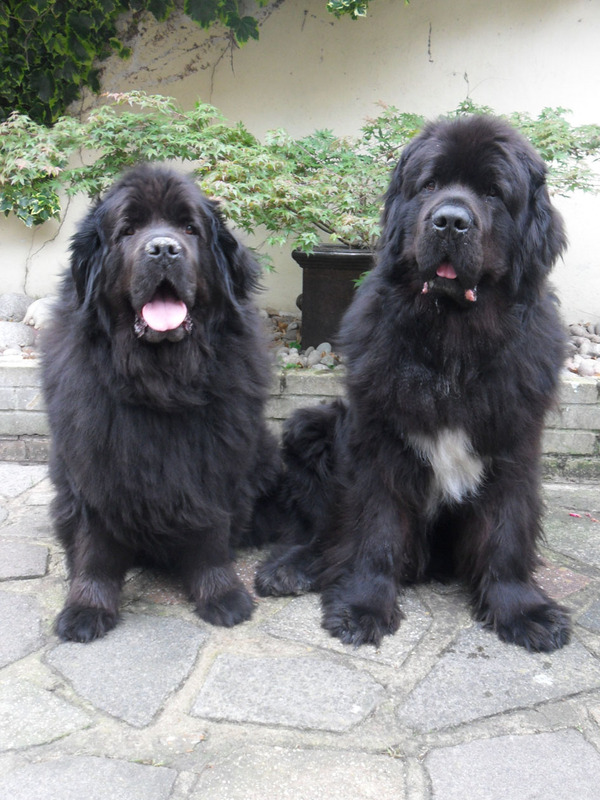 The idea is that whatever the style of the bear they will be my own very personal choice. 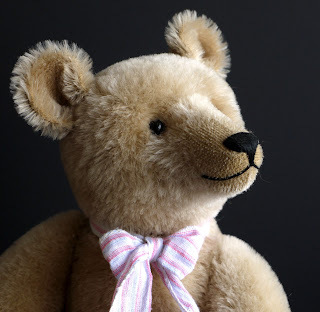 The first of these bears is called Higgs. 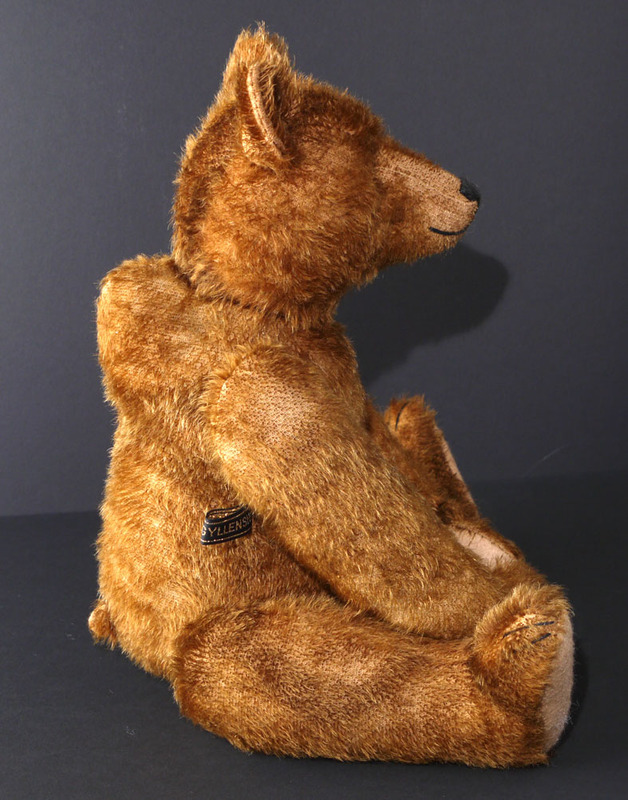 He is inspired by a bear which I made as a Christmas present for a very special friend some 11 years ago. 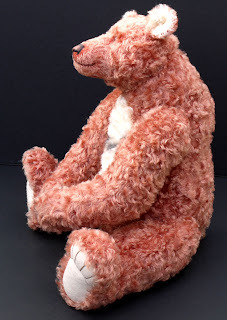 I still often see the original bear and I have tried to capture the same friendly intelligent expression and posture of the original and he is made from the same dense swirly fur but I have chosen the rather striking dusty coral colour. So I suppose I would say he fits into the category of a re-make of an old friend but with a surprise in the colouring. He is called Higgs because I happened to finish him on the day the discovery of the Higgs Boson particle was announced, I am not clever enough to understand exactly what that is all about but I think the bear probably does. 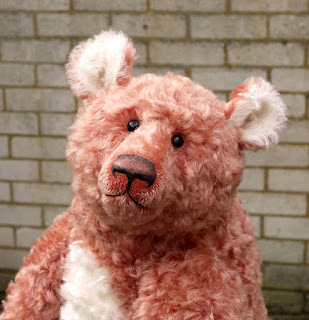 I am not setting any date deadlines for these bears, I will be making them from time to time over the remainder of the year and they will only be available from me direct, through my website or at shows. 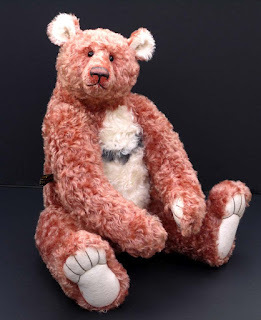 I intend to make a blog post to describe each of the special bears and I am planning a special gallery for them on the website. The last 20 years have brought me great pleasure and taken me on many journies, I have many exciting projects already lined up and plans for many new ideas so I am looking forward to many more years growing bears but I think it is a good idea to mark the achievement of the first 20 in this way. I have had a small piece of old mohair for some time, I am not sure exactly what it was but there seems to have been a slight pattern to it and by the time it came to me it had some considerable wear. Of course it suited a traditional bear and I worked out a pattern to use just about all of it, by the time it grew into a bear the pattern faded into part of the overall effect which is quite worn with some bald areas and variations in pile and shade. 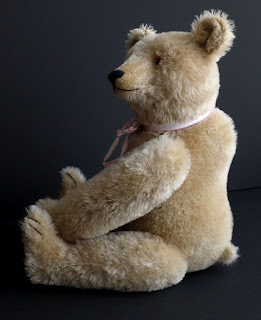 I need to make a lighter bear to ease the strain of some larger firmly constructed bears I have had to work on recently so he was made alongside other work to give my hands a little break from the firmest stuffing requirements but remain productive. 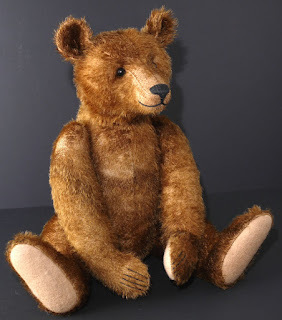 I have filled him with traditional excelsior wood wool which I have left a little loose so he has a crunchy feel so characteristic of a vintage bear. I have left his joints quite loose to avoid stressing the old fabric too much. 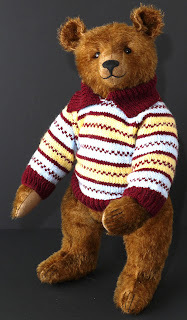 Now a dressed bear is something I have rarely attempted and I must at this point confess I didn't make the sweater but I had better explain why he is wearing it. 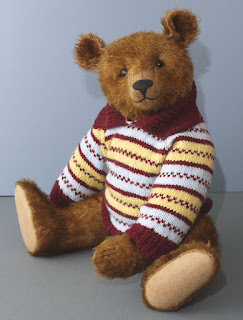 Having made this very worn looking bear I decided that he should wear some sort of clothing to help protect him in the same way that vintage bears are often given a sweater or waistcoat to cover bald patches and help prevent further wear. My mum knitted the sweater some years ago; I asked her for a jumper for one bear and she got rather carried away and I ended with a bag full of them, some of the colours were rather surprising; Mum's eyesight was failing but she had learned to knit without looking at the work and many of the little sweaters still displayed her skill with cables, fancy stitches etc. When Mum passed away the bear sweaters joined various other treasures and were in danger of being hidden away but I think it is more sensible to occasionally give one to a deserving bear, assuming I can find one to fit... I am very sentimental about such things so it has taken a while to pluck up the courage to break into the remaining supply of jumpers. 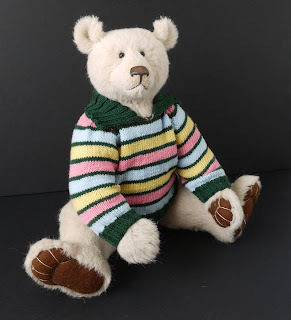 So that is a rather long winded explanation of how the worn vintage looking bear came to be wearing a sweater, he is very much a one-off since the genuinely old and worn mohair cannot be repeated and the supply of mum's little sweaters now very limited. He is available for purchase and you may e.mail me at gregory@hugoshouse.com or check my website www.hugoshouse.com for more information. record this brief moment of complete tidiness on film :-). 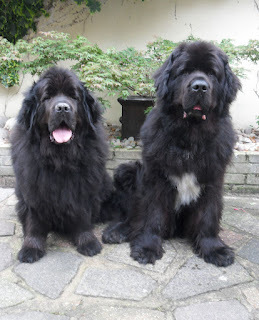 Suzanne is very good at getting dogs to pose for the camera and she persuaded Posh and Angus to sit relatively still in front of the nice spot in my yard so this is my excuse to share some of the pictures of my wonderful hairy friends. 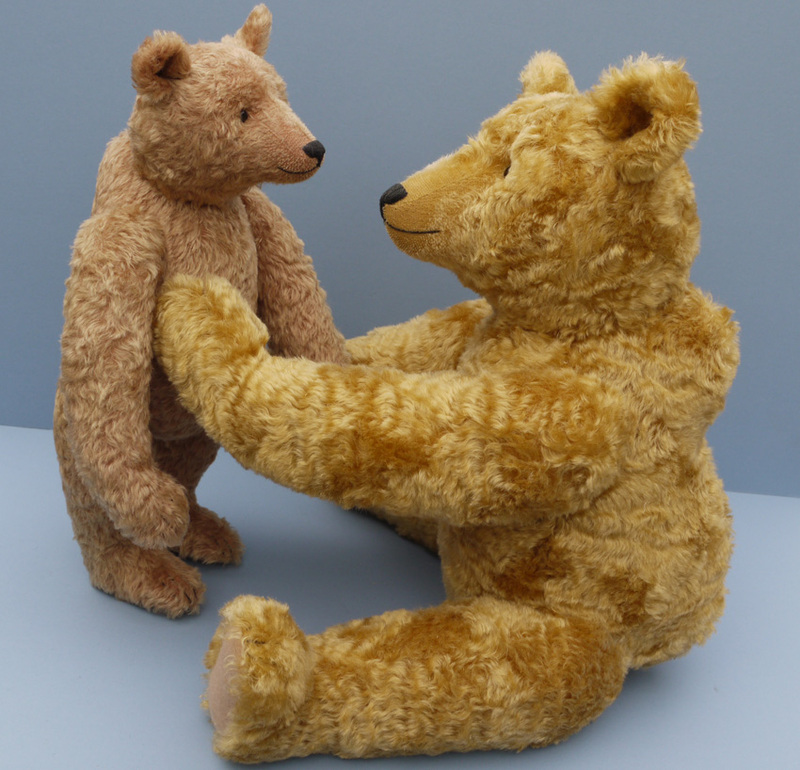 I have rarely ever made any commemorative bears but this year seems to have resulted in two being planned. 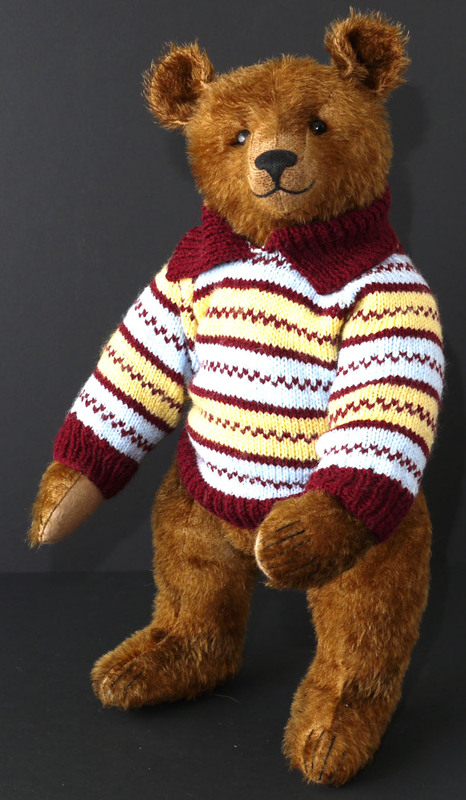 I have made a Bear to mark the Diamond Jubilee of Her Majesty the Queen. 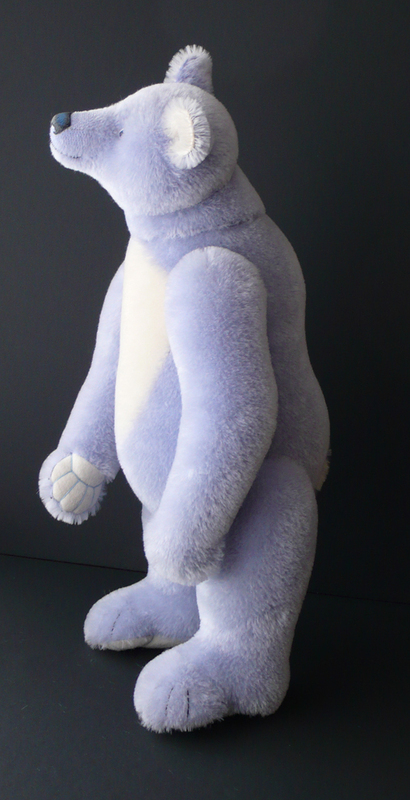 This is sneaky preview of the prototype, the bear will be available from Silly Bears with the first deliveries to coincide with the June holiday week-end. He is 18 inches tall and designed to sit or free stand equally comfortably, made from 2 shades of straight mohair with pure white paw pads, blue glass eyes set on white felt and my signature set, shaded and polished nose embroidery. Some of you have pointed out that I have been rather quiet recently, I have been locked away in the bear room making sure that I have some bears to bring to Hugglets show on Sunday. 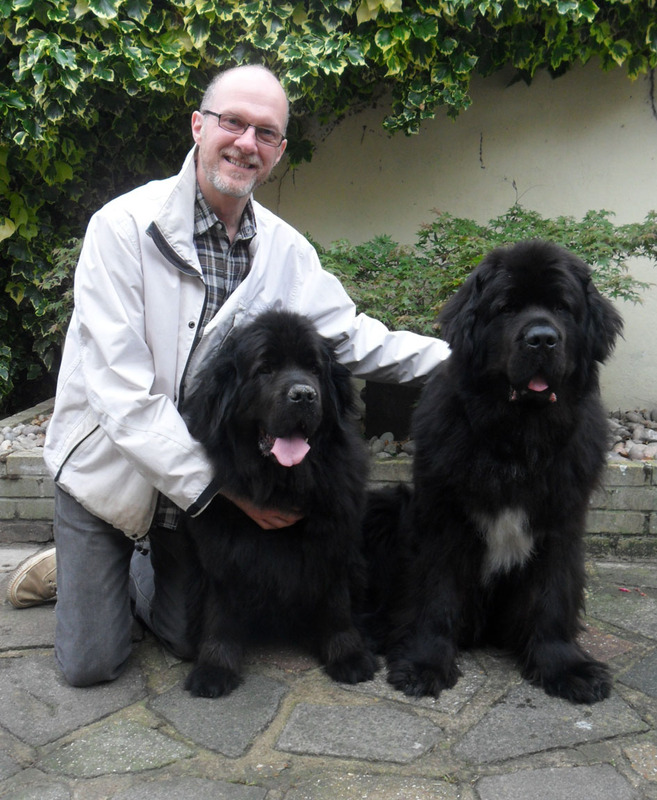 I will be in my usual place Stand 7 in the large Hall ( Hall 1 ) and look forward to seeing you at the show.